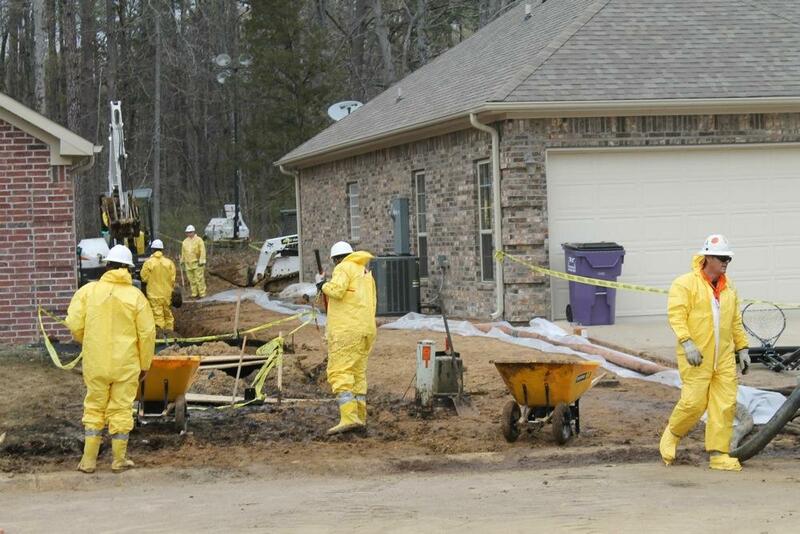 Workers on April 7, 2013, cleaning up after the pipeline Ruptured in a Mayflower neighborhood. A lawsuit brought on behalf of nearly 150 Mayflower residents impacted by a 2013 pipeline rupture has been settled. Attorneys with three law firms representing the residents confirmed with KUAR they had settled the suit with ExxonMobil, the pipeline operator. The attorneys cited a confidentiality agreement with the company that bars them from disclosing the dollar amount for the settlement or on what date it was reached. Records show the case was ordered dismissed in Faulkner County Circuit Court on December 21, 2015. “In our opinion it was the best result for our clients. And obviously it was one that both sides were mutually satisfied with. When you have that kind of situation, there’s a lot of factors that go into getting the people what they need and what’s going to put them back on their feet,” Daniels said. The Hare Wynn law firm represented 64 families in the lawsuit. Daniels said certain plaintiffs had the option to sell their homes to ExxonMobil. He said fewer than half of the plaintiffs his firm represented sold their homes. 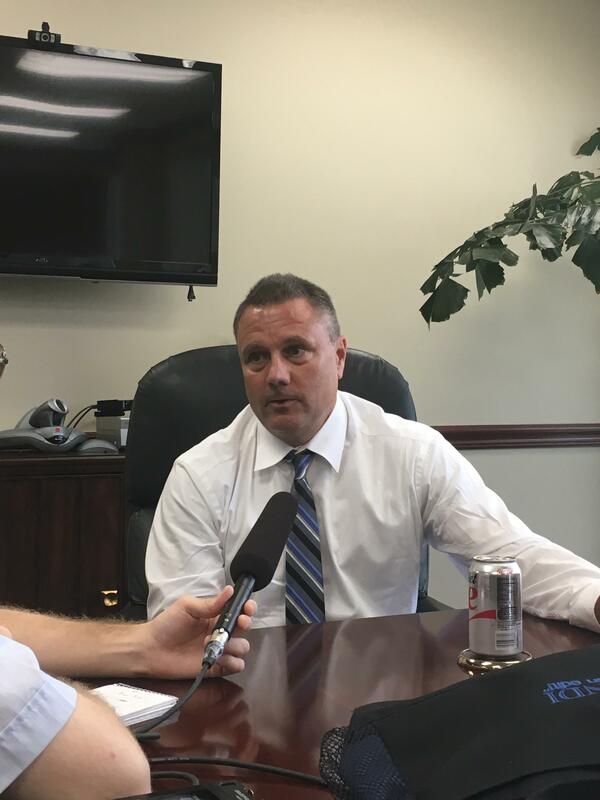 Additionally, attorneys from the Little Rock-based McMath Woods law firm and Conway-based Mickel & Chapman law firm also represented clients in the case. Mickel & Chapman worked in conjunction with attorneys from the Asheville, North Carolina-based Davis & Whitlock law firm. Attorney Tom Mickel of Mickel & Chapman acknowledged the deal in an emailed statement. “I can confirm that Mickel and Chapman, along with Davis and Whitlock of Asheville, NC, represented 106 tenants, homeowners and commercial property owners, all of whom were included in the settlement of which Hare Wynn speaks. We can say the matter was resolved on terms that were satisfactory to the parties,” he said. Attorney Sam Ledbetter of the McMath Woods firm also confirmed in an email that the firm’s clients were involved in the settlement. On June 1, the firm Davis and Whitlock posted a statement on its website making the deal public. “Davis & Whitlock is pleased to announce that the matter was concluded on terms that were satisfactory to the Plaintiffs,” the statement reads. ExxonMobil previously arrived at a $5.07 million settlement with federal and state authorities in 2015. A 20-foot long welding seam on the company’s Pegasus Pipeline burst on March 29, 2013. Estimates of the amount of oil released in the Good Friday rupture range from 3,000 to 10,000 barrels. The Wabasca Heavy crude oil spilled into the yards, streets and drainage ditches along a Mayflower subdivision and flowed into nearby wetlands, eventually entering a cove of Lake Conway, where booms and barriers were set up to prevent oil from reaching the rest of the reservoir. Daniels said the plaintiffs’ main complaint centered on the alleged mismanagement of the pipeline, constructed in the late 1940’s to transport Texas crude oil to Illinois refineries on an 850-mile course that also traverses Arkansas and Missouri. Over the pipeline’s lifespan, Canadian Tar Sands crude oil came into high demand and Exxon used the pipeline to carry it. The pipeline operator also reversed the direction of the flow and increased the pressure. Shawn Daniels is an attorney with Hare Wynn Newell & Newton. “So you’ve reversed the flow. You’re adding a thicker more abrasive product flowing through there and you’ve increased the pressure. At some point, that old pipe, just under the greater pressure is going to give. And that’s what happened,” Daniels said. According to the Associated Press, government attorneys have said the rupture led to about $57 million in damage in the subdivision and surrounding areas. Attorneys with the Little Rock-based law firm Wright Lindsey & Jennings represented Exxon and its subsidiaries in the case. By late Thursday, the firm had not answered KUAR's request for comment. KUAR's Jacob Kauffman contributed to this report. An attorney for landowners along a crude oil pipeline that ruptured in Arkansas in 2013 said Wednesday that Exxon Mobil Pipeline Co. breached its contract with his clients because the pipeline interferes with their ability to enjoy their property. A subsidiary of Exxon Mobil has filed court documents challenging the federal Pipeline and Hazardous Materials Safety Administration's authority to order safety measures following the March 2013 rupture of the company's Pegasus pipeline in central Arkansas.